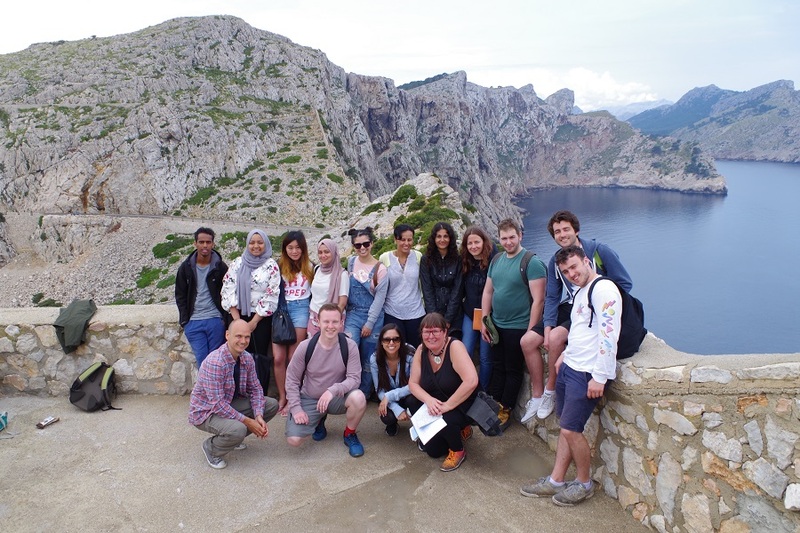 Dr Sue Brooks discusses the Department of Geography Annual field trip to Mallorca where the group researched the Mediterranean climate, tourism and agriculture. What is there not to like about the Mallorca field trip? Let’s start with the Mallorcan landscapes, dating back to the Triassic and Jurassic geological periods (@250-150 million years ago) when warm sub-tropical seas allowed the deposition of sediments, shelly fragments and bones, all to be uplifted in the Alpine Orogeny, beginning 65 million years ago and still active today. The result is the landscape of the Trumantura National Park an area of amazing relief, geology and challenging transportation. It contains one of the most hair-raising drives in Europe, accessing Cap de Formentor, but that did not deter our coach driver, who took on the hairpin bends, steep ravines and determined cyclists in a calm and composed manner to get us to the Cap. Next was a trip to the golden sands of Formentor Beach and an ice cream, quickly followed by the wonderful market town of Pollenca, where we were rewarded by the view of Es Pla (central plain) and the rooftops of Pollenca after climbing the Calvery Steps. The final journey took us to the Monastery at Lluc for another ice cream, and then back to Santa Ponsa via the strategically important reservoirs of Gorg Blau and Cubert, constructed in the 1970s to help with water supply across the island. Students were engaged in learning about tourism, agriculture and water supply set within the context of the natural landscapes. One task was producing an isohyet map to show the spatial distribution of rainfall across the island while at the same time discovering that the Mediterranean climate presents some considerable challenges through its temporal distribution of rainfall and the mismatch to tourism demand. 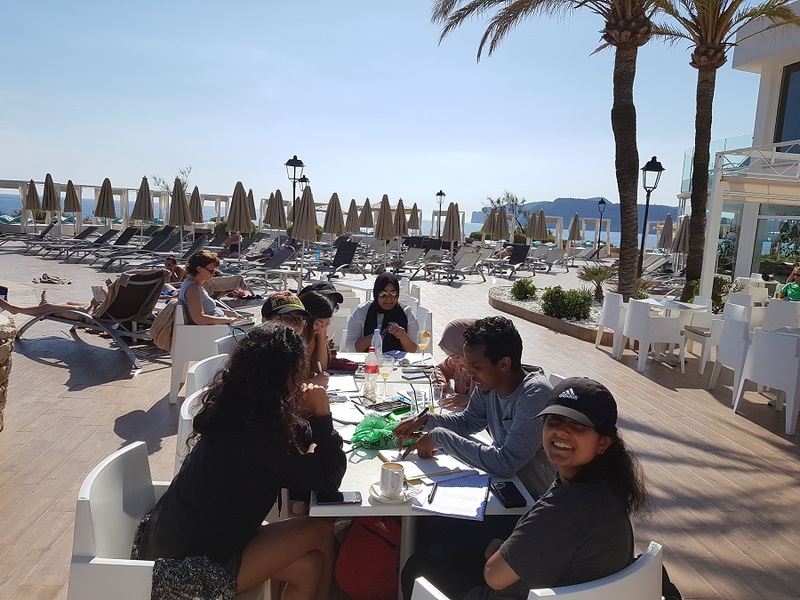 There was plenty of time for group work with projects on Santa Ponsa beach and in the ephemeral torrents that are so typical of the island. Project hand in was set for 5pm on the last day and everyone worked very hard to meet this deadline, before a relaxing evening with some travelling to Magaluf to join the fun there. Some students decided to stay on for a holiday and to fully appreciate the diverse and spectacular landscapes of the island. Thank you to all our students for your hard work, dedication and exemplary behaviour on the field-trip. We look forward to welcoming next year’s cohort for another wonderful experience. Category: Social Sciences History and Philosophy Tags: geography by Louisa.